Burger King’s mascot, the King, already has a full beard and moustache. So, in order to participate in the Movember Foundation’s movement, the fast food icon took a trip to the barber to kick off his #KingstacheChallenge. The King’s shave was captured in this ad, where he debuts a clean-shaven face for the first time. Fans are encouraged to follow the King’s transformation on his Movember profile, and participate in the #KingstacheChallenge by growing their own epic ‘staches and sharing on social media with that hashtag. Throughout the month, the King will show off different moustache styles – such as the Whopper Bun, the Grill Marks, and the Onion Rings – on the Movember Foundation profile. The global charity has funded over 1,200 innovative projects across 21 countries, and has raised $769 million for men’s health programs to-date thanks to the popularity (and ease) of successful programs like Movember. Companies have changed and updated mascots in the past. Mascots have even disappeared off cereal boxes to support a good cause. 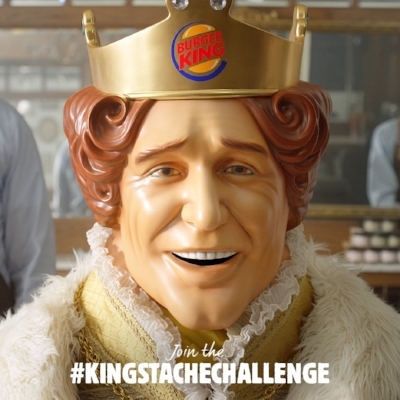 But, Burger King’s willingness to not only alter the iconic King, but share a transformation throughout the month, gives it a more real-time, human aspect – one that other men can connect and compete with while their moustaches grow in, all in support of men’s health.